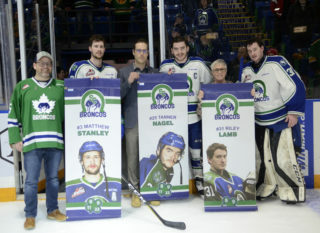 It was only three seconds away from requiring a shootout but the Swift Current Broncos scored on essentially their final scoring chance of overtime to pull off a hard-earned 5-4 overtime victory against the Saskatoon Blades at the SaskTel Centre on Saturday night. The game didn’t start off well for Swift Current as the Blades’ Gary Haden scored just 38 seconds into the contest after his four-goal outing on Friday night vs. the Broncos at the Innovation Credit Union I-Plex. Swift Current captain Tanner Nagel lit the lamp shortly after Haden’s goal to tie it 1-1. Blue liners Christian Riemer and Connor Horning drew assists on Nagel’s ninth of the year. 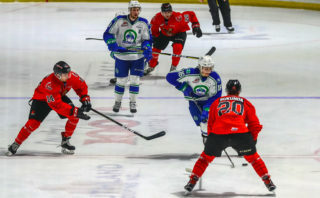 Saskatoon carried a 2-1 lead when the period horn sounded as defenceman Dawson Davidson netted a power play tally in the final minute of the first. 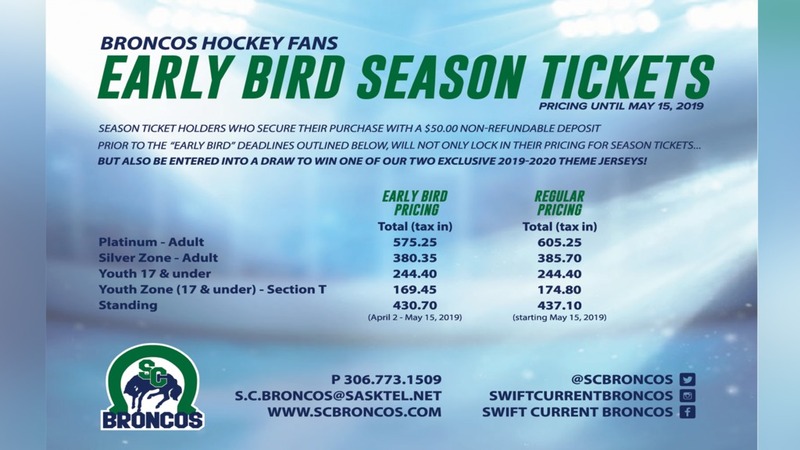 The Broncos’ Horning took an interference call at the 4:13 mark of the second resulting in Swift Current being shorthanded again but instead of the Blades doing some damage, 19-year-old Broncos forward Ethan O’Rourke forced a turnover and scored his eighth goal of the season to tie it 2-2. A product of Penticton, BC, O’Rourke has scored one goal in each of his last four games played. Another Broncos penalty put Saskatoon right back on the man advantage and this time they made use of it as Eric Florchuk gathered a loose puck in a scramble by the Broncos crease and tucked it in to make it a 3-2 game for the Blades. Cyle McNabb then gave Saskatoon a 4-2 lead before the second period expired. Shots on goal were 31-14 in favour of Saskatoon going to the third period. 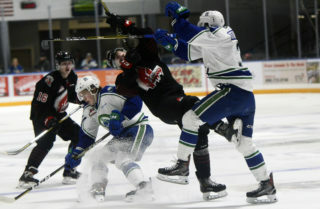 Swift Current never gave up as they executed on their scoring chances in the final five minutes of play. Nagel buried his second of the game on a mini-breakaway attempt from the opponent’s blue line to cut it 4-3. Broncos netminder Riley Lamb was pulled with 2:30 left for the extra attacker and it certainly paid off as Oakbank, MB product Owen Blocker got a good stride into the zone, received a pass from Joona Kiviniemi and picked the high corner by Blades goalie Dorrin Luding. The score was tied 4-4 and overtime was needed to determine a victor. 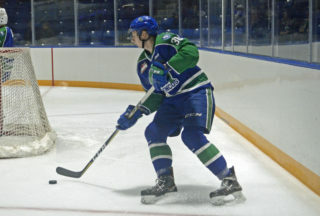 Blades forward Ryan Hughes took a two-minute penalty for tripping with 30 seconds left in three-on-three overtime, putting Swift Current on their fifth power play of the night. The Broncos won the faceoff in the offensive zone and won it 5-4 as Kiviniemi one-timed in his team-leading 12th goal of the season with three seconds left to seal an amazing come-from-behind win for Swift Current. Broncos defenceman Alex Moar tallied two assists while goaltender Riley Lamb compiled 48 saves in the win. Shots on goal were 52-24 in favour of Saskatoon. Both clubs went 2/5 on the power play. 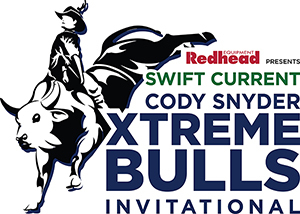 Swift Current goes home to take on the Calgary Hitmen on Wednesday, January 30th at the Innovation Credit Union i-Plex. Puck drop is slated for 7:00pm CT.